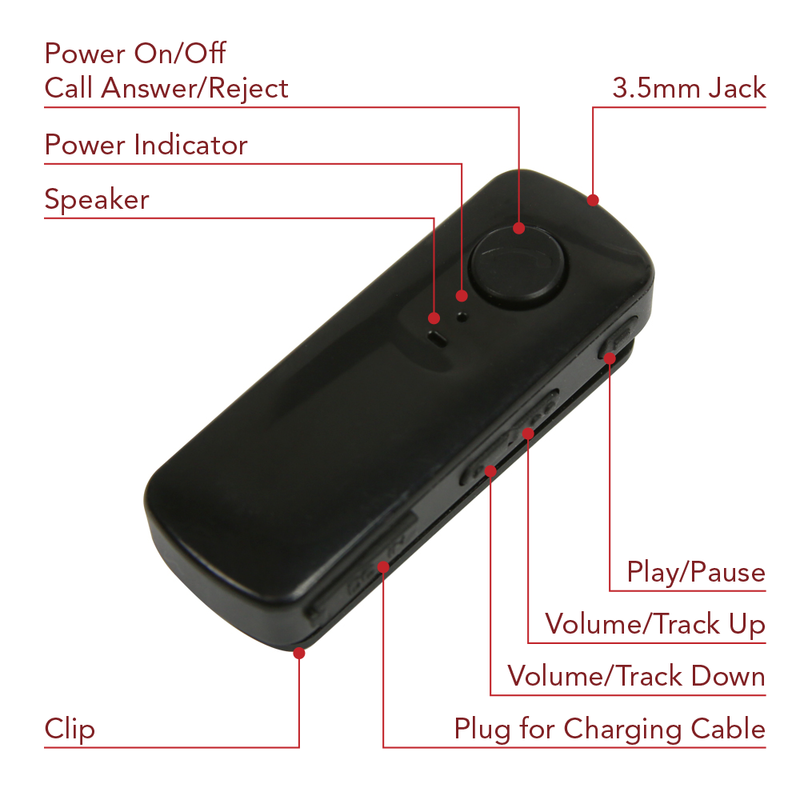 This user manual describes the features and operation of the HR-100 Bluetooth® Receiver. Please read these instructions carefully before use. Avoid using the Receiver near sources of extreme heat including heaters, radiators, stoves, and any open flame. Do not expose the Receiver to rain or wet conditions. Do not disassemble, repair, or modify the Receiver by yourself. Ensure the power is turned off when the Receiver is not in use. Keep the Receiver charged in order to avoid range issues and signal disconnects. Hold the Power On/Off button for 6 seconds to enable pairing. Tap the Play/Pause button to pause or resume your music. Tap the Volume/Track Up button to turn volume up, hold to go to the next track. Tap the Volume/Track Down button to turn volume down, hold and release twice to go to the previous track. While in use, tap the Call button to connect to an incoming call, hold for 2 seconds to reject the call. While on a call, tap the Call button to end the call. Please charge the Receiver before use. You can use the Receiver while it is plugged in and charging. The light will turn RED to indicate charging. When charging is complete, the light will turn off. Hold the Power On/Off button for 6 seconds to put the Receiver in pairing mode. The flashing blue and red lights indicate when the Receiver is ready to be paired to a device. Turn on Bluetooth® on your device and search for the “HR-100”. Connect to the Receiver. If needed, use password "0000". The Receiver is now paired and ready to be used! The Receiver will automatically reconnect to this device in the future. Tap the Volume/Track Up button to turn volume up. Tap the Volume/Track Down button to turn volume down. Press and hold the Volume/Track Up button go to the next track. Hold and release the Volume/Track Down button to go to the previous track. Press the Call Answer/Reject button once to connect to an incoming call. While on a call, press the Call Answer/Reject button to end the call. To reject an incoming call, press and hold the Call Answer/Reject button for 2 seconds. Compatible with most Bluetooth enabled mobile devices including iPhone and Android tablets, smartphones, and more. Follow these steps to resolve common problems with your Receiver. Unable to pair a device. Check that the Receiver is in pairing mode (flashing blue and red lights). If not, restart the Receiver. Adjust volume level of the Receiver. Move the Receiver closer to the device. Not working or cannot turn on.